Unemployment is challenging for anyone, but it is particularly difficult for people with disabilities or other unique support needs. Self-employment is a growing option that offers new possibilities as an alternative way to earn income. This course is the ninth in a series of courses on customized self-employment and is based on the work of Griffin-Hammis Associates, leaders in the field of employment support. Starting and operating your own business requires new skills and abilities for both the prospective business owner and their support team. Failure to take care of managing finances and government benefits can cause many problems, so this training provides critical information on two of the most important aspects of self-employment: Managing the finances of the business and the business owner’s government benefits. Through comprehensive lessons, examples, as well as interactive activities, you will gain the skills and confidence you need to support individuals in managing their own finances and benefits while operating their own small businesses. This course is applicable to people who support individuals with developmental disabilities, mental health challenges, physical disabilities, as well as other intensive support needs, especially those who receive government benefits. 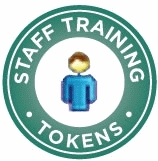 If you are taking this course within a learning management system that offers continuing credit, you must successfully pass the final exam and complete the course evaluation in order to receive credit. Describe what is meant by SSDI being an “all or nothing” program. 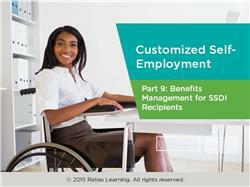 Explain what the key to assessing ongoing eligibility for SSDI is. Name at least one work incentive that may be claimed under the SSDI program.